Another woman has come forward to say that Alabama Senate Republican candidate Roy Moore committed sexual misconduct against her when she was a minor. 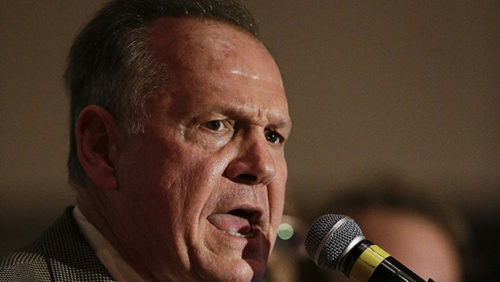 The woman, who is so far unnamed, is making her charges publicly known, alleging that Moore sexually assaulted her. She is not one of the women named in the recent Washington Post article, where a woman said Moore initiated sexual contact with her when she was 14, and several others described Moore pursuing them for “dates,” sometimes successfully, when they were teenagers. Moore told Sean Hannity he dated “a lot of young ladies” when he returned from the military and was in his 30s. The legal age of consent, then and now, in Alabama is 16. Two of the women have also said he supplied them with alcohol. Moore has denied the charges of sexual contact with the 14 year-old, Leigh Corfman, as well as to supplying minors, Corfman included, with alcohol. Corfman is so far the only one to come forward who was under 16 at the time of the alleged incident. The latest woman to come forward with allegations of misconduct will hold a press conference at 2:30 p.m. EST in New York City, with her attorney Gloria Allred. “The new accuser wishes to state what she alleges Roy Moore did to her without her consent,” Allred said in a statement. Some Republicans, like Sens. John McCain and Mitch McConnell, are calling on Moore to step aside in the race against Democrat Doug Jones, with polls showing Jones beginning to open up a lead over the scandal ridden former judge. Sen. Roger Wicker of Mississippi went further, The New York Times reports, dismissing the charges as “very, very old” and asking why the women didn’t come forward sooner. The election between Moore and Jones is now less than a month away, with Alabamans heading to the polls on December 12.